Devart has a component suite called PgDAC for accessing PostgreSQL databases using Delphi XE5 Firemonkey. 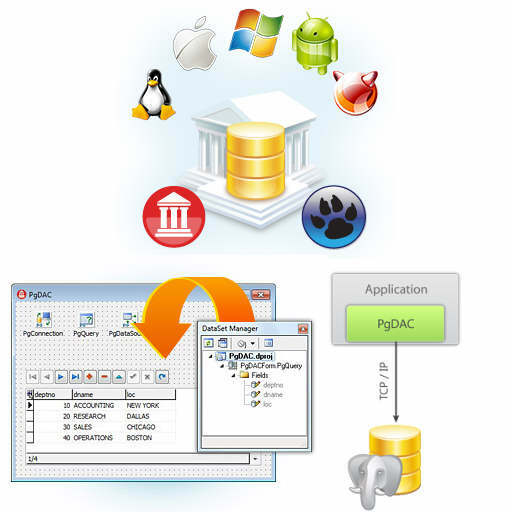 PgDAC allow you to access your PostgreSQL database directly from Android and IOS devices in addition to from the desktop on Windows and OSX. The components are a commercial offering but there is a free trial to check them out before purchasing. It has some interesting components in the package including: TPgEncryptor which allows you to encrypt your data on the client, TPgDump which will store and restore parts of your database as a script, and TPgSQLMonitor which allows you to monitor dynamic SQL execution in your PgDAC applications. These are native Delphi components and libpq.dll is not required for these components to function. If you need to access PostgreSQL databases from Delphi XE5 Firemonkey on mobile devices be sure to give these a try. Head over and download the free trial of the Delphi Firemonkey enabled PostgreSQL components.